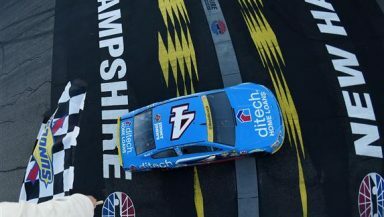 LOUDON, N.H — Kevin Harvick had a perfect restart with six laps to go and outlasted Matt Kenseth to win the Bad Boy Off Road 300 at New Hampshire Motor Speedway. The win gives Harvick a ticket to the second round of the Chase to the Sprint Cup Championship. The Stewart-Haas Racing driver started 19th and worked his way into the top 10 before the first round of green flag pit stops. He moved his way through the field to settle into the top-five but wasn’t in the discussion of who would win the race until the final restart. The race was dominated by Toyota drivers Carl Edwards, Martin Truex Jr., and Matt Kenseth. Edwards led the first 31 circuits before being overtaken by Truex Jr. Kenseth came into the picture just past halfway and battled with Truex throughout most of the second half of the race. While they were battling for the lead, Harvick was running in fourth place when a caution for a Trevor Bayne accident in Turn 4 came out. On the restart, Truex couldn’t get going and Harvick used the outside lane to clear Truex and get into second place when a caution came out for Ricky Stenhouse Jr. and Reed Sorenson spinning off Turn 2 to set up the final shootout. When the green came out, Harvick had a solid restart and Kenseth spun his tires allowing Harvick to pull away and claim the victory. Kenseth held on for second, Kyle Busch was third, Brad Keselowski took home fourth and Kurt Busch rounded out the top-five. In the media center following the race, Kenseth took the blame for the final restart. Keselowski struggled in the early part of the race and was in danger of going a lap down on the first run and came back for a fourth place finish. Kurt Busch overcame a rough pit stop and overheating issues to finish fifth. Several Chasers struggled at New Hampshire. Joey Logano went down a lap early but eventually got the free pass and rebounded to an 11th place finish. Austin Dillon wrecked his primary car in the first practice and spent most of the race a lap down. He received the lucky dog on the Trevor Bayne accident and came back for a 16th place finish. Tony Stewart started 22nd and was in the top-15 when handling issues were too much to overcome and finished one lap down in 23rd. Chris Buescher struggled all afternoon and finished two laps down in 30th. As the Sprint Cup Series heads to Dover, the four Chase drivers on the outside looking in are Jamie McMurray and Austin Dillon who trail 12th place Kyle Larson by five points, Tony Stewart sits in 15th place 11 points behind Larson and Buescher is 30 points behind the 12th spot.